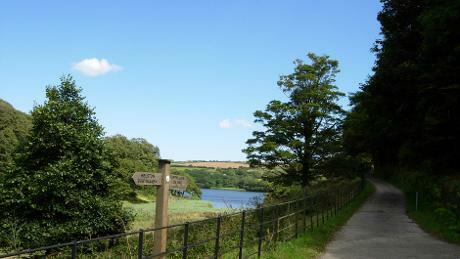 Loe Pool is Cornwall’s largest natural lake.The lake is also known as ‘Logh’ from the Cornish meaning pool. It is a Site of Special Scientific Interest and has been owned and managed by the Natural Trust since 1974 when the Penrose Estate was given to the Trust by Lieutenant Commander Rogers. Loe Pool was once filled with abundant underwater vegetation. In the summer of 1848 it was recorded that ‘the whole of the lake, except some of the deepest parts, is filled to the surface with tangled weeds which greatly interfere with the sport of fishermen’. However, since the mid-1970s up until 2006 every summer saw a change in Loe Pool when algal blooms would develop. The algae dominated the water, turning it a murky shade of green, shutting out the light and de-oxygenating it.This process is called eutrophication. Monitoring data informs the Forum that approximately 50% of the nutrient input into Loe Pool originates from point sources and the other 50% comes from diffuse sources upstream of Helston including agriculture, domestic septic tanks and light industry. The point sources include South West Water’s sewerage treatment works at Helston and RNAS Culdrose. Working in partnership with South West Water and RNAS Culdrose the Forum have made huge progress in reducing the nutrient enrichment. In 2003 South West Water invested in infrastructure to strip out the phosphate which has caused much of the enrichment. As a result there have been no algae blooms since 2006. The Forum continues to work closely with South West Water and RNAS Culdrose to drive further infrastructure investment which will improve water quality. Successful rehabilitation of the lake still requires addressing upstream sources of nutrients and sediment. In partnership with Catchment Sensitive Farming and Soils for Profit the Forum has made great progress in engaging with the agricultural community. At the heart of both these schemes is the method of providing grants and advice to farmers to help reduce diffuse pollution while saving farmers money and improving farm enterprise profitability. 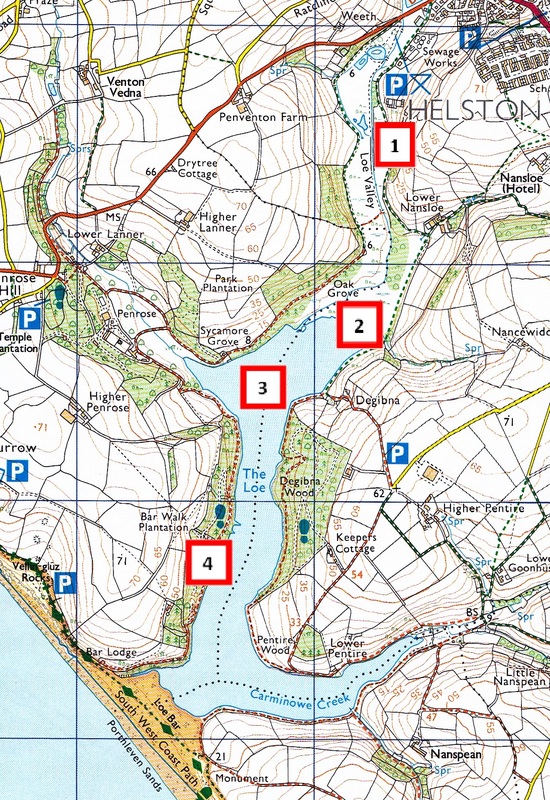 1 – Willow Carr: The Willow Carr at the Helston end of Loe Pool is a relatively recent feature developed on the large amount of river sediment material deposited during the late nineteenth and early twentieth centuries, when tin mining was taking place in the catchment. Nevertheless, it is of high ecological interest, featuring a mosaic of reed beds, small shaded pools, large decaying willows, dense carr and open glades. The expanse of Grey Willow also provides an extensive spring nectar source for a wide range of insects. 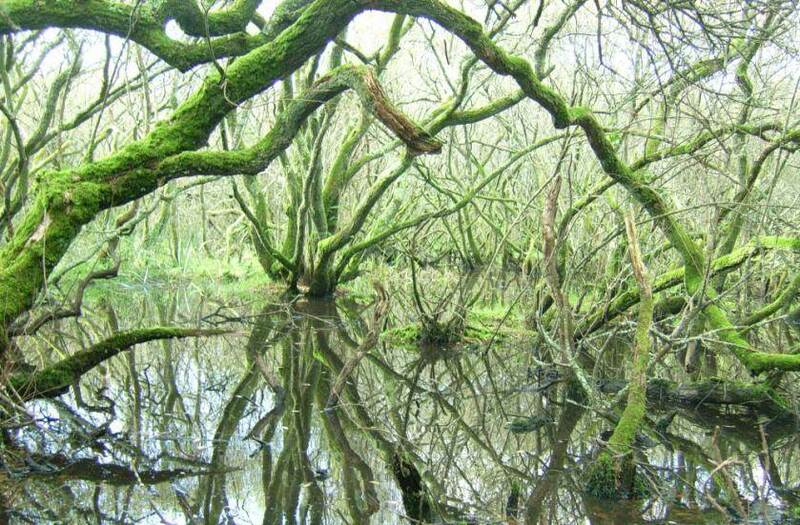 In fact, the Cober valley contains the largest community of Grey Willow in West Cornwall. The generally open nature of the carr means that the ground flora is also well-developed, with a good diversity of wetland species, such as yellow iris, meadowsweet, and trifid bur-marigold, which is rare in Cornwall. The southern end of the carr is wetter with extensive stands of common reed. In 1946 a section of the Cober between Loe Marsh and Helston was canalised (see the Catchment Page for more detail). It seems that the main effects of canalisation have already taken place. The rate of change due to drying is now probably much slower and, in terms of plant species composition, virtually imperceptible. However, unusually dry summers in the future, perhaps linked to climatic changes, may have a more significant detrimental impact on the carr than in the past. The wetland ground flora may be under greater threat as a result. 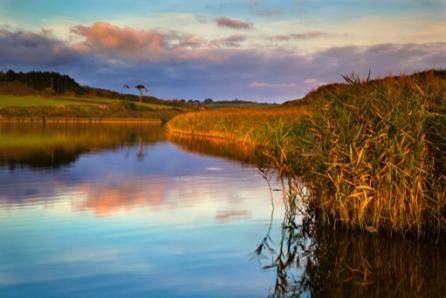 2 – Loe Marsh: At the outfall of the Cober is Loe Marsh, a reedy shoreline which encroaches on the water area at the rate of approximately 1 metre every 20 years. Aerial photographs from 1946, 1988 and 1996 show that there has been a gradual spread of reed beds around the edge of the pool over the last 50 or more years. The main reason for the increase in reed beds is not clear, but the reduction in grazing since 1989 would appear the most likely. Increased nutrient levels may have been another contributing factor. The willow carr and reed beds support a number of significant bird species such as reed warbler, sedge warbler, and reed bunting. Reed bunting is on the RSPB Red List and has undergone a 50% decline since 1996. Cetti’s warbler has also been recorded. This is an RSPB Amber List species, hardly appearing in Cornwall until the late 1970s, with most Cornish populations restricted to the Tamar Valley, Penrose,Gunwalloe and Marazion Marshes. 3 – Trout and Otters: The unique Loe Trout use the river for spawning but are vulnerable to fishing. 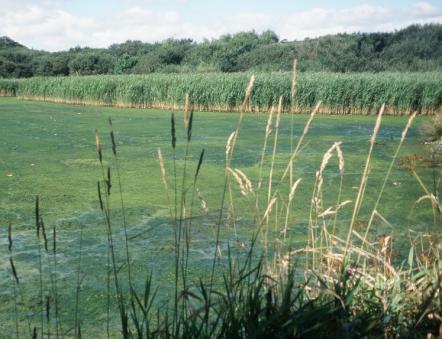 The poor water quality and algal blooms favour other species such as rudd and perch. Dredging in the river can affect the success of egg development in the gravels. Where water quality is good, they spawn very successfully. Otters have been recorded along the Penrose stretch of the River Cober and around Loe Pool itself. However the flood alleviation works undertaken in 1988 caused considerable deterioration of their habitat and also created a new informal path, which is regularly used by dog walkers. 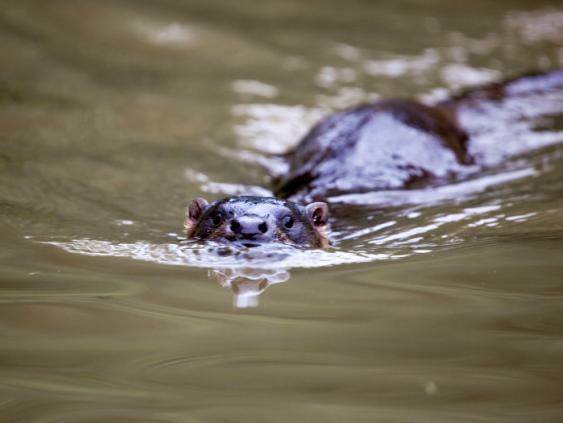 This additional disturbance is likely to further reduce the quality of habitat available for otters and other wildlife. 4 – Woodlands: Woodlands have been both an important aesthetic and an economic resource at Penrose for many centuries. They provide renewable timber, fruit and fuel, as well as beauty and inspiration for owners and visitors alike. The woodlands and parkland trees have reflected changes over time and their longevity means that they can often still provide glimpses of the past use and management of the land. Understanding the past is often the first step to thinking about how to manage woodlands into the future. As the owner of Penrose the National Trust has a responsibility to protect the landscape and wildlife habitats of the woodlands, along with providing opportunities for public access and enjoyment. The conservation management of woodlands and trees at Penrose today is probably much less active than at any time over the last 300 years. Past management for practical purposes, or aesthetic reasons, has given way to a broader understanding and appreciation of natural processes and woodland ecosystems. This ethos underpins the Trust’s whole approach to woodland management. Where possible, woodlands are being allowed to slowly revert to a more natural state, creating a wide variety of habitats and associated species. Old and decaying trees are retained and fallen trees are left in situ, providing deadwood for invertebrates and space for new saplings to germinate and thrive. Oak, ash and hazel are re-colonising old plantations of beech, sweet chestnut and holm oak, shifting the species composition towards a more semi-natural habitat. Limited control of invasive species such as sycamore is helping this process. Salt-tolerant pines are being planted in pockets to perpetuate their presence in the landscape of mixed woodlands. In the parkland area, the formal landscape is being maintained but the specimen trees will require replacement over time. With the predicted climatic change, the challenge for the Trust is to look ahead and attempt to predict which species may be more suited to thrive over the next 20-50 years and beyond. Increased frequency of storms may also pose new challenges. Due to samples taken from pollen below the pool confirmation has been thereby presented that arable land existed there millennia ago, before the sea came up into Helston around 1014 AD. Helston, as we know it, was a port for only a comparatively short period until some time before 1260 AD when the oldest section of St. Johns’ bridge was constructed. During the next 700 years a 25 foot deep belt of silt accumulated along Nansloe Valley upon a seven foot depth of sea sand, upon peat, upon the rock bed. The initial formation of silt began to close off the harbour that was situated in Castle Green car park, with only part of its wall left. That wall extended right up to where the 1833 road is now, enclosing small trees and shrubs by c1800 AD. However, just recently, Roman remains have been detected under the pool; so if Hen Lis ever had a port in Roman times it was not likely to have encroached any further than there. Do you have any details of the Roman remains under Loe Pool?